Are you ready to take the next step? You have mastered comb and coil binding, made magic with twin-loop wire, and now you want the quality of perfect binding with the freedom to produce one or one hundred copies at a time, right? Then Hard Cover Book Binding is what's next. MyBinding.com offers a wide selection of options that will deliver solid results within a realistic budget. Our products will have you binding and finishing on demand like a publishing guru. 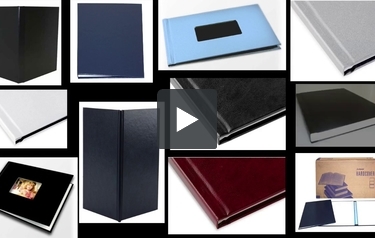 Take the plunge, and prepare to impress with high quality perfect bound hardcover books. Use them to create awesome presentations, yearbooks, memory books, photo books or even coffee table books. The possibilities are limitless. This is MyBinding video. If you’re looking to do some hardcover binding or use hardcover cases, you’ve come to the right spot. There are times when comb, coil and twin loop wire do not make the cut for the presentation you want. You need perfect binding, hardback binding. MyBinding.com offers a wide selection of options that will deliver solid results within a realistic budget. Products like the UniBind Photobook System will have you binding and finishing on demand like a publishing guru. In addition to UniBind, there’s also Powis Parker, Akiles and a handful of other thermal binding systems. If you’ve got questions, we’ve got answers. Give us a call, we’d love to help you get exactly what you need to get going. When image matters, MyBinding.